The world’s largest LNG bunkering vessel has started operations. The world’s largest LNG bunker supply vessel Kairos started operations in northern Europe on December 11, according to Linde's LNG bunkering subsidiary Nauticor. The ice-class vessel was formally handed over by the owner Babcock Schulte Energy in the Lithuanian port of Klaipeda to its charterer Blue LNG, a 90%-10% joint venture of Hamburg-based Nauticor and Lithuanian oil and LNG terminal operator Klaipedos Nafta. It also received partial EU funding. Nauticor CEO Mahinde Abeynaike said the handover of Kairos, which has LNG tank capacity of 7,500m3, meant it would "secure the supply of LNG as a marine fuel in the Baltic Sea on a large-scale basis" adding that the ship's pumping rate is equivalent to more than 30 LNG trucks per hour, thus ensuring an extremely fast and safe LNG ship-to-ship supply. "From now on, also large vessels can bunker LNG in the Baltic Sea,” he added. 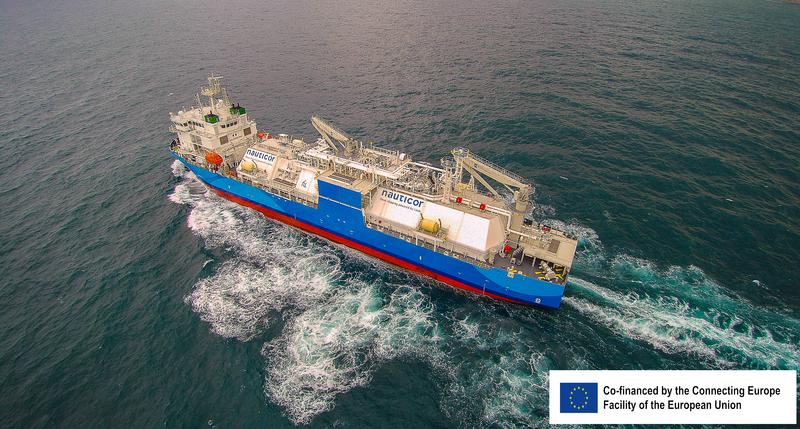 Nauticor senior sales manager Jan Schubert told NGW that the vessel's operational area includes the North Sea and Baltic Sea, with the firm currently preparing bunker operations in various countries including the Netherlands, Germany, Denmark, Sweden and Finland. Kairos will be used on contracts to supply shipowners including Finland's ESL Shipping, Sweden's Destination Gotland and some others to be announced in the coming weeks, he added. Construction of the vessel began 2016 when Blue LNG signed a time-charter with Babcock Schulte Energy. In February 2018, steel cutting took place at Hyundai Mipo Dockyard in Ulsan, South Korea, and in October 2018 the vessel was delivered by the shipyard. Kairos is the ancient Greek for 'the right moment' – no doubt suggesting that switching to LNG from low-sulphur oil product alternatives is positive for the environment and may make commercial sense. But for one of the largest LNG-fuelled cruiseliners, AIDAnova, the right time has been and gone. German broadcaster NDR on Dec.11 and other sources reported that shipyard Meyer Werft will now hand over AIDAnova to Carnival subsidiary Aida Cruises on December 12. The ship is now scheduled to pick up its first paying guests on Dec.19 for their cruise to Tenerife. The ship had originally been scheduled to depart Hamburg Dec.2 on its maiden cruise, reaching Tenerife Dec.12, following a handover that had been expected to happen last month. It is the first LNG-fuelled cruiseship to have been built in Germany.